Dr. Dean Kane in his Baltimore Cosmetic Surgery and Medi- Spa Center is now offering the new Ideal Implants for patients seeking the newest technology in Saline Implants for breast augmentation with or without a breast lift. The Ideal Implant gives the feel of a silicone gel implant but uses saline or salt water solution to fill and expand the implant. From the 1960’s and into the 1980’s, silicone had been used to develop the shell and the fill of breast implants. Its particular chemistry allows the linking of the silicone chains to be liquid, oily, sticky, gel, gummy and solid. It remains the best, most inert material to make the shell of breast implants and remains so today. Concerns regarding the more liquid center during the 1990’s generated much research and discovery to identify the gel as safe and therefore made available once again as a choice for breast implants. Women love the feel and the tear-drop shape. Despite this, women have had a remaining concern of safety. During this time, the silicone shell / saline implant became popular in the United States. The side-effect of such implants were the round, full and tight projection / appearance in many patients. Even with over-filled saline implants, the shells would appear lose and wavy over time. The 2 types of implants with some minor modifications remain today with the least amount of leakage historically. In 2014, a new innovation was FDA approved and came to market. Called the Ideal Implant because it provide a similar soft and natural feel similar to silicone gel implants with the “peace of mind” of having no internal silicone gel material. The baffling or double lining reduces the issues of rippling or wrinkling that the older traditional saline implant produces over time. Made of a silicone shell, it is stacked and baffled so the saline fluid will not wave back and forth nor need over-filling. It is also found to produce less capsule contracture or leak rates than the previous saline and gel breast implants. The edges of Ideal Implant are curved toward the body making for a smoother transition and contour toward the chest wall. As compared to the older saline implants that have a larger projection often making them look firmer and stiffer on the chest wall. 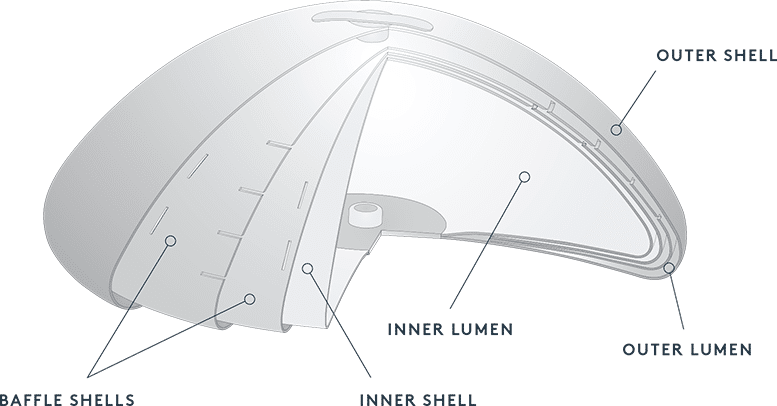 The double lumen in the Ideal Implant creates a much softer feel than the traditional saline implant and again is more similar to the silicone gel implants. Ideal Implants also allow them to be placed in the same sub-muscular position though a smaller incision, like that of the saline implant. As they contain no gel, Ideal Implants need no MRI to diagnose a leak. Why choose the Ideal Implant? For patients 22 years and younger, the FDA has limited the use of silicone gel implants and only allows this group of women to have access to saline implants only for cosmetic augmentation purposes. While the Silicone Gel Implants have been completely approved by the FDA, there are women who feel strongly that they only want to have a saline implants. Up to 2014, all these women only had the traditional saline implants to choose from. Now the Ideal Implant gives women the peace of mind that it only contains Saline (salt water solution), but feels very similar to the softness of a silicone gel implant. Each patient has unique requirements when considering breast implants. Selecting a Board Certified Plastic Surgeon with the skill, understanding and the availability of all implants provides you with your best options and outcomes. In a consultation with Dr. Dean Kane, you will be given a full evaluation and given all your breast surgery options including a full understanding between the differences in all the silicone, saline and now the Ideal Implants. Lauri Kane works alongside of her husband providing patient education. With her 25 years of experience, she will spend quality time helping you select just the right size and shape implants. Call their office today 410-602-3322 or email Lauri@DrDeanKane.com to answer your questions and set up your consultation.